Posting the Book Now Button your website lets you give your customers a simple and stress-free scheduling experience that will make them love you even more. Below, we share the steps you’ll need to take to get the button onto a Weebly website. First, log in to both your Genbook account and your Weebly site editor. We recommend you have these two sites open in separate tabs of the same browser. Then, follow the steps outlined below. 2. On the following page, select the button size and color you’d like to display, then highlight and copy the TOP/first piece of code. 3. 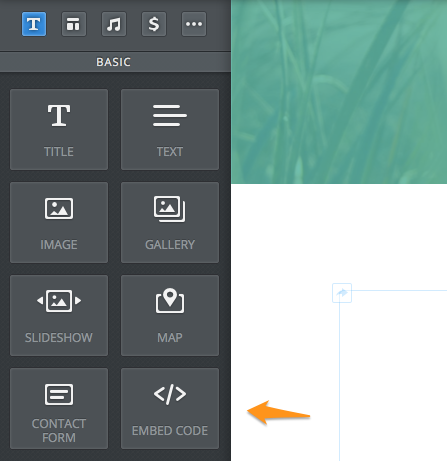 In your Weebly site editor, from the left side menu, click and drag an “Embed Code” box to where you’d like the button to appear. 4. Click inside the box that says “Click to set custom HTML”, then choose the orientation of the button (left, center, or right) and click on the “Edit custom HTML” button. 5. Paste the Book Now Button code you copied from your Genbook account into the box provided. 6. Click out of the HTML box, refresh your page, and you should see the Book Now Button appear in the spot where you’ve pasted the code. When you’re satisfied with your edits, click the “Publish” button to make your changes live on your website. Your Book Now Button will appear on your live site exactly as it did in the Weebly site editor’s preview.